Welcome to the Creepy Hollows Official Online Store! :) We are a New Age store unlike any you've ever seen! We offer a vast range of bindings from spells & enchantments for collectors, Spirits from various realms & cultures for Keepers, and haunted objects with paranormal energy for collectors. We are a full-service paranormal & metaphysical online store catering to all collectors who enjoy the obscure, intriguing, mysterious, and amazing. We offer the best in Spirit Keeping, Magick, Haunted Artifacts, Witchcraft, Pagan, Wiccan, Supplies, Tools, and more. Registration for the shop is 100% free and as a registered user you can keep track of your actions on the site including your wish list, order history, order archives, etc. Our shop offers, regularly, in excess of 8,000 listings. We offer hundreds of spells, hundreds of spirits, and hundreds of special offers and listings. We deal with many one-of-a-kind vintage, antique, and ancient items as well, and encourage anyone interested in these items to act quickly as many of the more rare bindings sell out within hours of them being posted. You can utilize the Search box towards the top of the screen on any of the shop's pages to search the titles only of the listings in the store! Or, if you prefer a more detailed search where you can search the content of the descriptions, by SKU, or other more specific critera, click on the "Advanced search" link to the right of the box! We have many, many categories in the shop because we have tried to organize the listings as efficiently as possible to make finding what you're looking for, easier. For spells you will see they are separated into detailed categories of their own as pertains to the binding. In some cases you may see bindings of multiple spells or enchantments appear in multiple categories. Custom Spell Bindings: you tell us what you need, desire, or want, and we custom cast a spell or spell-blend for you! Custom Conjuration: a technique CH was the first to offer on the internet, and is means we conjure the spirit specifically for you as dictated by your unique energy signature. For a more detailed glimpse into the terms standard in the community and phrases created by CH, like "energy signature", please reference our Dictionary. We offer a range of payment options on the site, including layaway. We do accept money orders. They must be a United States Postal money order. You can pay for your treasures over a period up to 4 months from the date of the Layaway agreement, all items are shipped when the Layaway is paid in full. By selecting the option of Layaway in the store checkout you are entering a purchase contract. You must put 20% of the total amount down immediately and can make payment on your account through Paypal or Credit Card over any period of time up to 4 months. If decided to abandon originally selected treasures all monies paid on Layaway account will become store credit that can be used on any other vessels or services. 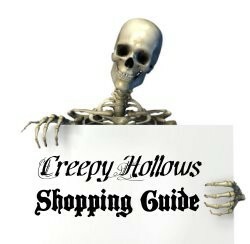 To make Layaway payments at any time on a layaway you've placed you can make payments of any amount, at any time to layaway@creepyhollows.com through Paypal. Leann receives all emails regarding payments from Paypal and attaches payments made to orders. You need to give her up to one week to attach any payments. If you need to pay by credit card, please open a Helpdesk Ticket and ask Princess to create you an invoice through the shop to pay with your credit card. You may not have more than 10 open layaways at any given time! If you place more than 10 we reserve the right to cancel the subsequent layaways and put the balance towards open orders. This policy helps eliminate impulse purchases & other collectors missing out on something when a those who place many layaways start canceling & opening new orders. Once an order is placed work on the order begins 3 days after the order is received. Depending on what is ordered dictates the amount of time the order will take to completely process. We do offer partial shipment as an option, and you can opt in or opt out of this in your store profile. This ensures what can be shipped is done so before what may take longer to complete. You are always well-informed about your bindings and you will have all the information before your package ships. When your treasures arrive you know just what they are! When you buy a prebound spirit you receive a download of the spirit's information so you have it before your vessel arrives :) When you buy any spell or ritual with instructions you receive your instructions via download or you can look them up any time in our Knowledgebase. With some special bindings your instructions will be emailed to you, but this is noted in the listing so you know! If you want paper print-outs with your bindings you can opt for paper in your customer profile. Our busiest season of the year is from September (our Anniversary month) to January (holiday season spanning Halloween, Christmas, & New Year). During this season it can take the full 30 days for an order to ship. We strive to keep it shorter than that, but we receive literally thousands of orders during this time and to ensure everyone receives the attention they deserve and they are not rushed out of the door we treat each order individually and on its own merit. This is why we have the stellar reputation for our work that we do and why we have & continue to grow leaps and bounds every year. Typically shipping with Creepy Hollows can be anywhere between 3 days to 30 days. We do our best to process orders as efficiently as possible however we do take the time to make sure each person is receiving spirits and/or spells that best suit them, doing this gives us the opportunity to make adjustments when necessary. We do not strive to earn our reputation in fast shipping, but quality work. We take the responsibility of the paranormal with the utmost respect at all times! 7 days a week. Because we receive so many orders a week there are times we may partial ship orders if custom work is present on the other that will take additional time. Typically shipping with Creepy Hollows can be anywhere between 3 days to 2 weeks. We do our best to process orders as efficiently as possible however we do take the time to make sure each person is receiving spirits and/or spells that best suit them, doing this gives us the opportunity to make adjustments when necessary. We do not strive to earn our reputation in fast shipping, but quality work. We take the responsibility of the paranormal with the utmost respect at all times. If you need your order ASAP we have placed an expedited shipping option at checkout. This means your order is processed faster and shipped faster than standard orders. Orders that are SRA only (meaning nothing else is in your order but SRAs) can take up to 6-8 weeks to ship. Because SRAs are surrendered spirits to us from Keepers who are no longer able to care for them, for various reasons, we are meticulous in our placement of them with new Keepers. We will either partial-fill an order or hold an order until suitable spirits are found. This is one of the most important steps! Under the "Your Account" box on the right-hand side of the screen, click "Modify Profile", this brings you to the screen where you can update your name, billing address, shipping address, phone number (which we must have for international customers for shipping), email address, and custom profile fields we inserted to further assist in completion of our work for you. Here you can opt in or opt out of receiving partial shipments, let us know what type of vessel you'd prefer if for some reason we need to select a vessel for a binding for you, date of birth if there are spells or rituals which require your DOB, and your preferred ring size for times when the vessel is a ring. We update this area from time-to-time so you may see additional customized profile fields appear in this section. Always feel free to complete them as they become available as it helps us to customize your bindings above & beyond what we already do. You can also sign up for Membership for discounts store-wide. What membership level am I? General Membership: Anyone who buys from this site is put into general membership; meaning they can take part in any sale, any special offer or discount offered publicly. New to CH: If you are new to the site and you are just learning with us we have this membership to get your started. This is a permanent 20% off at all times. Forum: If you are a member of our Forum here, you can apply for the Forum membership. This is a permanent 20% off at all times. Plus a 55% off perma-sale any time there is not a greater sale discount. Loyal Customer Membership: If you have more than 5 orders you an apply for this membership. This is a permanent 20% off at all times. Plus a 55% off perma-sale any time there is not a greater sale discount. Sentio: If you have spent more than $300 in the shop between all of your processed/completed orders you can apply for this membership. This is a permanent 30% off at all times. Plus a 60% off perma-sale any time there is not a greater sale discount. Diamante: If you have spent more than $2,000 in the shop between all of your processed/completed orders you can apply for this membership. This is a permanent 40% off at all times. Plus a 65% off perma-sale any time there is not a greater sale discount. Carissimi: If you have spent more than $10,000 in the shop between all of your processed/completed orders you can apply for this membership. This is a permanent 55% off at all times. Plus a 70% off perma-sale any time there is not a greater sale discount. You can only belong to one membership at a time. Bonus Points How do the Bonus Points work? It is 1% credit back for every dollar spent in the shop. Every dollar you spend earns you a bonus point. Each bonus point is worth $.01. They are redeemable at any time. Once a year we have a customer appreciation day when the bonus points are worth $.05 each. How does the lifetime vessel replacement work? We have all had a vessel break or have lost a vessel and been unable to repair or retrieve it. This happens to all collectors whether they are novice or well-seasoned. We offer free transmution of your spirit into a new vessel for all class 4 and class 5 spirits. For class 3, 2 and 1 we do this at an extremely discounted rate. This applies to a vessels you purchase through the Creepy Hollows website, Creepy Hollows store, Creepy Hollows Marketplace site and all listings for Creepy Hollows on eBay. The replacement vessel will be equivalent to the original vessel.